I know it has been much too warm to think about hot Chocolate. Regardless, do not let the weather stand in the way of sampling a bonaza of hot chocolate flavors during the City Bakery month long Annual Hot Chocolate Festival. I'm heading over there right now, for details click here. Asks the beaming attendant behind the counter? The choice is a lip biting difficult one. On bone chilling days like we have had since being teased with 70 degree temperatures a couple of weeks ago, the only possible way to survive until Spring final does arrive is to indulge in a decadent cup or mini mug of City Bakery's delectable hot chocolate. Not too sweet, you will feel its thrilling warmth down to your toes. Every time I come here I drawl over the mouth watering desserts, but never order one because a little voice warns it would just be too much. 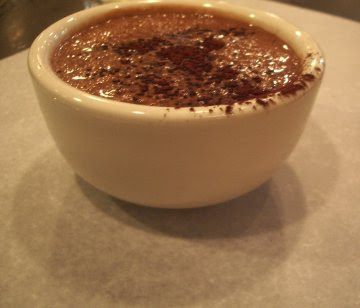 This hot chocolate is so filling that after a few sips, you feel as if you've eaten an entire meal. So rich, so thick, it is prepared in vats like a hearty winter soup. Don't sit at a table and wait to be served. It's a treat for the eyes to stand at the counter where you can watch the velvety textured hot creamy chocolate as it swirls around in the vat. Notice the glass bowl filled with hefty chunks of just made marshmallows; so meaty, you can eat them with a fork. A mini bowl or demitasse cup, with marshmallows or without, what will it be? However you take it, don't allow yourself to miss out on this lick your upper lip good experience. You'll find The City Bakery just off Fifth Avenue at 18th Street. Address to remember: The City Bakery, 3 West 18th Street, New York, NY 10011, www.thecitybakery.com/, 212-386-1414. Directions: MTA from 42nd Street Times Square, N, R or W to 23rd Street. Bus M2, M3, M5.